Electrical conductivity is the movement of charged particles. In this case, charged particles means either delocalised electrons or ions. These particles need to be free to move in a substance for that substance to be conductive. Covalent compounds do not conduct electricity because there are no charged particles that are free to move. Ionic compounds only conduct electricity only when molten or in solution. When solid the ions are not free to move. When molten or in solution the ions are free to move. Electrolysis: The breaking down of a substance caused by passing an electric current through an ionic compound which is molten or in solution. New substances are formed. Solid lead bromide is heated and becomes molten. Explanation: ions become free to move. 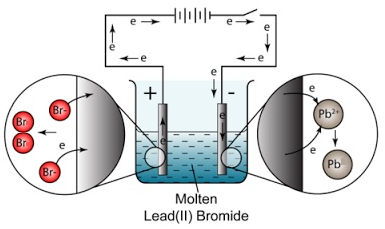 Electrodes attached to a power source are placed in the molten lead bromide. Explanation: these electrodes are made of either graphite or platinum because both conduct electricity and are fairly unreactive. 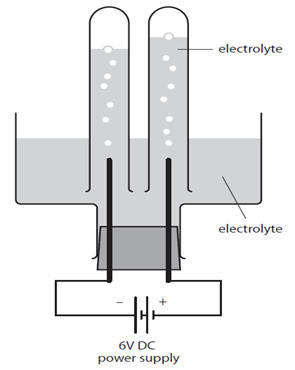 From the diagram, the left-hand electrode becomes positively charged, this is called the anode. The right-hand becomes negatively charged, this is called the cathode. Explanation: delocalised electrons flow from the anode to the cathode. At the anode a brown gas is given off. This is bromine gas (Br2(g)). 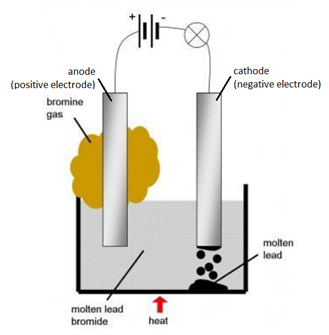 Explanation: Negatively charged bromide ions are attracted to the anode (positive electrode). At the anode, bromide ions lose electrons (oxidation) and become bromine molecules. At the cathode a shiny substance is formed. This is molten lead (Pb(l) ). Explanation: Positively charged lead ions are attracted to the cathode (negative electrode). At the cathode, lead ions gain electrons (reduction) and become lead atoms. Solid sodium chloride is dissolved in water. Explanation: The sodium ions and chloride ions become free to move. Chloride ions (Cl–) and hydroxide ions (OH–) are attracted to the anode. Sodium ions (Na+) and hydrogen ions (H+) are attracted to the cathode. At the anode a green gas is given off. This is chlorine gas (Cl2(g)). Explanation: chloride ions lose electrons (oxidation) and form molecules of chlorine. The chloride ions react at the anode instead of the hydroxide ions because the chloride ions are in higher concentration. The amount of chlorine gas produced might be lower than expected because chlorine is slightly soluble in water. At the cathode a colourless gas is given off. This is hydrogen gas (H2(g)). Explanation: hydrogen ions gain electrons (reduction) and form molecules of hydrogen. The hydrogen ions react at the cathode because hydrogen is below sodium in the reactivity series. The solution at the end is sodium hydroxide (NaOH(aq)). Copper sulfate solution is composed of copper ions (Cu2+), sulfate ions (SO42-), hydrogen ions (H+) and hydroxide ions (OH–). At the cathode a shiny orange layer is formed. This is copper. Explanation: copper ions gain electrons (reduction) and form atoms of copper. 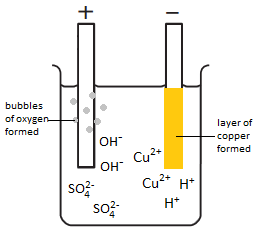 The copper ions react at the cathode instead of hydrogen ions because copper is below hydrogen in the reactivity series. At the anode, bubbles of gas are given off. This is oxygen gas (O2(g)). Explanation: hydroxide ions lose electrons (oxidation) and form molecules of oxygen and water. The hydroxide ions react at the anode instead of the sulfate ions because the hydroxide ions are less stable. Sulfuric acid is composed of sulfate ions (SO42-), hydrogen ions (H+) and hydroxide ions (OH–). At the cathode bubbles of gas are formed. This is hydrogen gas (H2(g)). Explanation: hydrogen ions gain electrons (reduction) and form molecules of hydrogen. 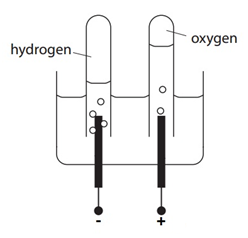 At the anode, the product of electrolysis is always oxygen gas (O2) unless the solution contains a high concentration of Cl–, Br­- or I– ions, in which case a halogen is produced, e.g. chlorine gas (Cl2), bromine gas (Br2), and iodine gas (I2). The diagram shows an electrolytic cell. The electrolyte is an aqueous solution. For example it might be concentrated sodium chloride, NaCl (aq). The test tubes over the electrodes must not completely cover them to make sure the ions are free to move throughout the solution. In the case of NaCl (aq) bubbles of gas will be seen forming at the electrodes. These float up and collect in the test tubes when each gas can be tested to assess its identity.